Our fabulous jewelry is expertly made using high-quality brass plated in your choice 14k Gold, Rose Gold or Sterling Silver. Our process guarantees longevity over lower quality brands. Each bracelet orders includes our signature white glossy cotton filled gift-box with a fun gold glitter heart on top. Boxes measure 3.5"x 3.5"x 1". We've already found the words! Our thoughtful notecards are included with each order in your choice of Pink or Black text. Measurements: 6.5 Length, 2.5 Wide. Nickel & Lead Free. TIME SAVING & GIFT READY - This time saving; gift ready option is loved by busy brides. 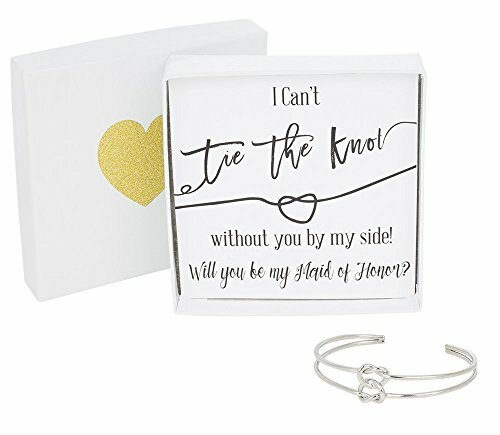 Each bracelet includes a 3.5" x 3.5" x 1" white glossy cotton filled gift box AND a pre-written notecard with the words "I can't Tie the Knot without you by my side! Will You be my Maid of Honor?" Text comes in your choice of Pink or Black. THE LEMON HONEY JEWELRY PROMISE - Compare our knot bracelet to ANY of our competitors and you will see how fabulously we do business. We can't wait to "Wow" You!